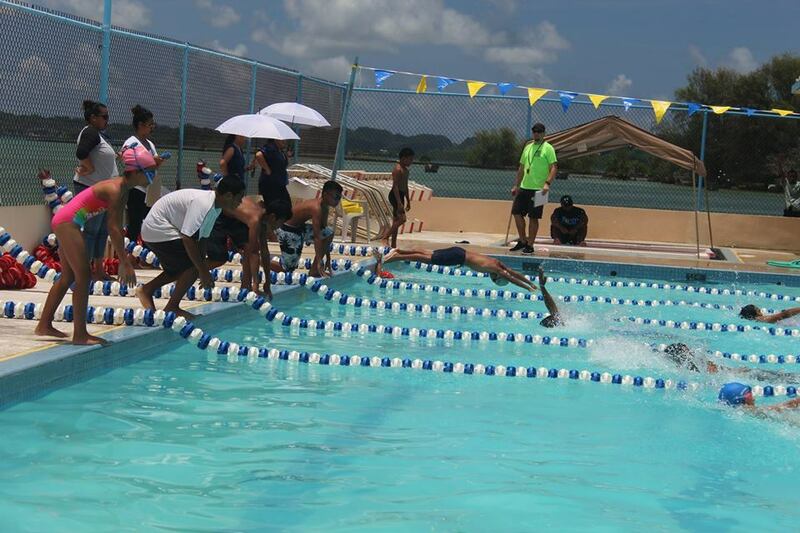 On April 20th, Palau Swimming Association hosted its second annual “All Elementary Schools Swimming Championships” that was open to all of the public and private schools across Palau. 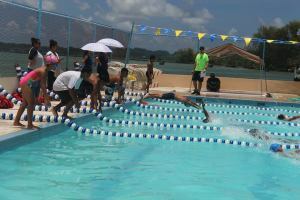 This was an amazing swim meet as we had 115 swimmers from across Palau participating in this event. Over the past couple months, Coach Billy Brown has travelled out to the outer islands to perform several swim classes for the schools, in hopes that the schools would travel to Koror to participate in this event. Although a couple schools backed out due to countrywide testing that week, we still had a good turnout with six schools that participated in this event. A good sign of how the meet is expanding is the fact that Kayangel Elementary School, the farthest island up North, travelled two hours by boat to swim in this event. The event itself has grown immensely since last year, with twenty more kids participating than last year. Also, to the fact that the kids swam a much wider variety of events and challenged themselves to longer distances than they did last year. In fact, it was so evident that in the 25m Butterfly, two kids participated in the event last year, followed up with 25 kids swimming the same event this year. They also swam longer distance events like the 100 Freestyle and the 100 Individual Medley. The event has certainly grown in this short time and is catching on fast with the kids and teachers across the islands. Throughout the meet there were many great swims, and a lot of surprisingly good races. It is clearly noticeable the kids are now getting more familiar with all four of the strokes, and the format of a swim meet. At the end, Ngarchelong Elementary School won the event for the second year in a row, but this time in dominating fashion, winning by just over two hundred points. It was a close finish for second place though, with Koror Elementary School, followed closely by Meyuns Elementary School. The big surprise though was how Kayangel made a big statement with their six kids (compared to the other teams who had 15 or so kids each), by pulling off a strong fourth-place finish in the meet. Palau Swimming will be hosting this meet again next year at this time, with the goal of getting over twelve schools to participate. We are even about to start the “All Elementary Schools Open Water Championships” next year.